Dre’s got nothing on me–my beets are fresh! Ha! Get it? See what I did there. Beet borscht tastes great with a few boiled potatoes and a scoop of cold sour cream. There is nothing that makes me think of the my family history more than a steaming hot bowl of neon pink soup. No, this isn’t a serving of chemical warfare, it’s a fresh and sweet, soothing bowl of beet borscht. My grandma still makes this and at most Jewish Deli’s you can usually find it on the menu right next to corned beef, chopped liver and matzah balls. What can I say? My roots are authentic and so is my cuisine. Except grandma never made this dish in the crock pot! Now if this was truly home cooking, I would use fresh beets, but I’ve found that the canned version works just as well and the pink juice adds a certain flavor feature as well. Grandma taught me to cut sliced beets into strips instead of buying the canned variety of matchsticks. Somehow the matchstick ones are too mushy. (According to grandma, of course.) Authentically, I would hand slice some cabbage, but I love the fine style of angel hair cabbage that I can purchase at my grocery store. It cooks up quicker and doesn’t contrast the texture of the beets as much. Keep a few of these items on hand in your pantry and you can have beet borscht anytime you want! If you make this dish with fresh beets, just clean, peel and shred them before throwing them in the crock pot. The taste is very similar to this recipe, but the beautiful pink broth cannot be matched! It truly is extraordinary. But that pink color will most likely stain your cutting board. And your fingers. And your countertops, before you even realize the glow has been dripping! This soup can be made vegetarian or meat-based. In fact, try cooking down beef bones or chicken bones to make your broth instead of using store bought. I know, I know… this meal is so “processed”, but hey, it’s a weeknight, and sometimes even the Crock Pot Queen needs a a quick meal to fix. Give this a try and keep an open mind. Put on those Dre headphones and drop the beat. But not the beet. It will probably stain. 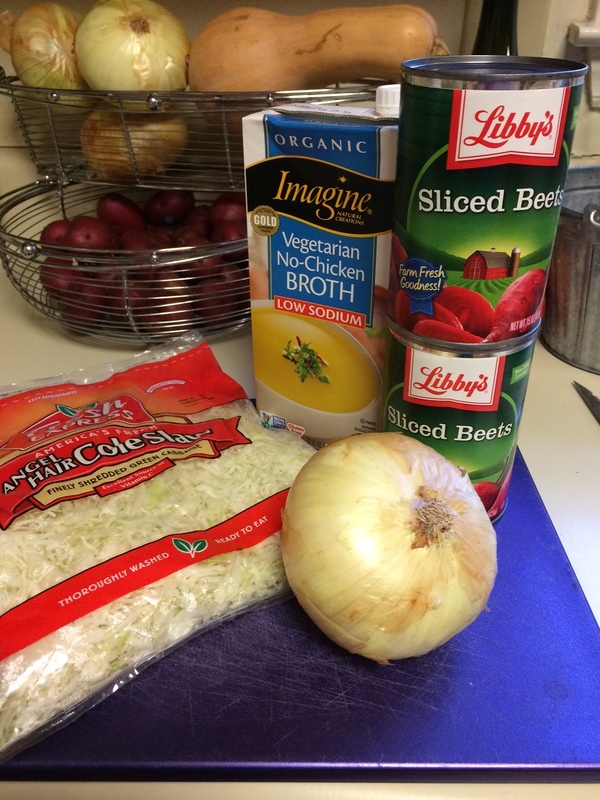 Slice the onion and put in the crock pot with the cabbage, bay leaves, and garlic cloves. Drain the cans of beets into the crock pot and then cut the sliced beets into strips. Add stock and cook on high for 3-4 hours. Clean and quarter the potatoes and bowl separately. 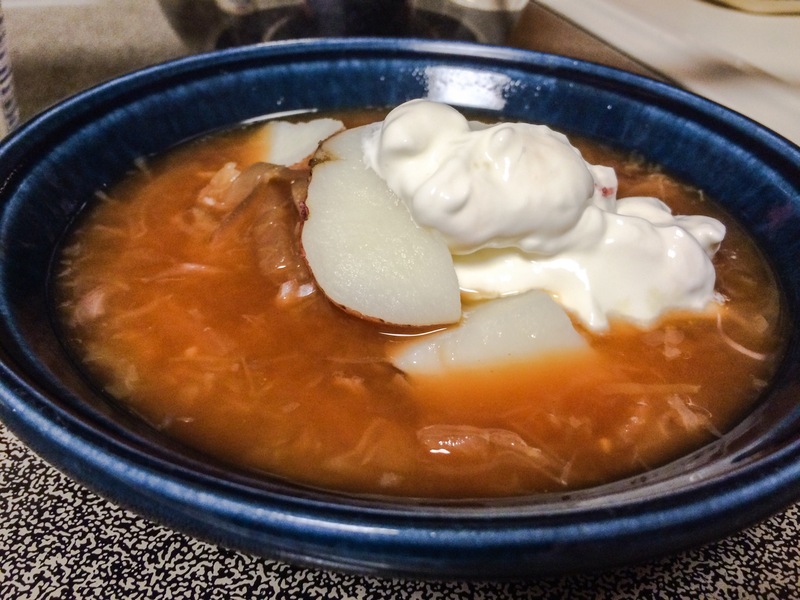 To each serving of soup, add a few chunks of boiled potatoes and a dollop of sour cream. Borscht is also refreshingly delicious served cold.